"The Warning" is a novel by Paul McGuire that has been featured on the Fox News Network. This is the book that predicted it all and gives the solution about what you can do to save America before it is to late! In this novel America, Canada and Mexico are merging into a North American Union. The American economy crashes, there is a WMD attack on America by a terrorist cell and Martial Law is declared. Tension explodes in the Middle East between Israel and Iran. America attempts to force Israel to divide the land which sets off a chain reaction of apocalyptic events in America. A powerful charismatic cult leader, who works with governments around the world to control people and populations through mind control, sets up a one world economic system and global government. The government demands that U.S. citizen's accept a biochip implant. Both political parties are controlled by the same Shadow Government. The hero of the book uses talk radio and the Internet to put a Third Political power into office that represents the Constitution and Judeo-Christian values. The major media and both political parties unite to destroy this Third Political Party who wants to stop America from joining a global government. The book's hero, Luke London, with the help of the people of the United States of America, does an end-run around a powerful Shadow Government that wants to merge Canada, Mexico and the United States. After the defeat of Adolph Hitler the U.S. and the Soviet Union competed for Nazi scientists who were experts in both mind control technology and rocketry. During the rise of the occultic Third Reich, the German Protestant Church marched in the streets to support Hitler. The theology of the German Protestant churches during pre-Nazi Germany was very similar to the theology of the "Evangelical Church" of today through movements like the "Emergent Church." The "Emergent Church" promotes a similar theology as the German theological school's of "Higher Criticism." The theology of the Emergent Church is simply a new form of Higher Criticism. It has weakened the church, making society ripe for take-over by occultic totalitarian forces. Powerful forces conspire to destroy the U.S. Constitution and enslave "We the People." Using mass social engineering and MK-ULTRA mind control they attempt to brainwash the masses. But a remnant people who know their Constitutional rights and take the Bible seriously use their legal political rights to overthrow the conspiracy to destroy America and bring in a one world government and one world economic system. (Pictured Left: German Protestants marching in the streets to support Adolph Hitler and the occultic Third Reich.) The German Church in pre-Nazi Germany had drifted from the Bible into humanism in the same way the Church in America has done through movements like the Emergent Church. A spiritually weak Church provides an atmosphere where the occult and totalitarianism flourish. One of the first signs of this is that the people begin to look at politicians as theri Messiah, rather than God. Historically, the end is always the same: concentration camps and a police state. In Paul's book, The Warning, he shows how the Nazi's did not disappear, but have infiltrated the highest levels of power in finance and politics. After WWII a secret intelligence operation, code-named Operation Paperclip, imported hundreds of Nazi scientists to the U.S. They became the heads of powerful defense laboratories, intelligence agencies, and developed the most sophisticated mind control programs, such as Operation Blue Bird, MK-ULTRA, and Operation Monarch, which produced individuals who became Manchurian Candidates for a variety of purposes. This book has been read by Congressmen, FBI agents, intelligence operatives, Hollywood, Prime Ministers, and people in the highest levels of the government. Privately, they agree that The Warning is a must read and a "warning" that must be heeded before it is to late. This book gives a practical game plan about what ordinary people can do to save our nation. 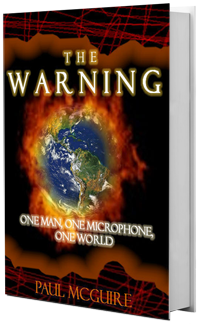 The Warning says everything Paul could not say in terms of Bible prophecy and current events in the media. This prophetic novel is written in kind of a code which the reader can figure out. You must read this book to understand what is happening in America and the world. The prophetic clock is ticking and it is later than you think. Help get the word out and buy multiple copies for friends and family.